It has been said that every man is an island. Nowhere is that more true than at the gym. As any gymgoer can tell you, there are few situations more awkward than that of being forced to exchange grunted syllables between panting breaths with a complete stranger. That said, go to the gym with any sort of regularity, and you can’t help but get to know the few other gentlemen that make the same daily pilgrimage as yourself. Such was the situation in which the Volkswagen Passat CC was brought to my attention for the first time in this calendar year. Having recently had his Jetta TDI manhandled by a large American sedan, a fellow gymgoer confessed that he hoped his Jetta would be written off so as to put him in a fiscal situation that would allow the purchase of a Passat CC. To say I was surprised would be an understatement. Why? Well, simply put, my own frontal lobe is not often occupied with thoughts of Volkswagen’s upper-crust sedan, and I’d assumed others were similarly ignorant of Volkswagen’s second attempt to outflank Audi’s premium image. And why shouldn’t they be? 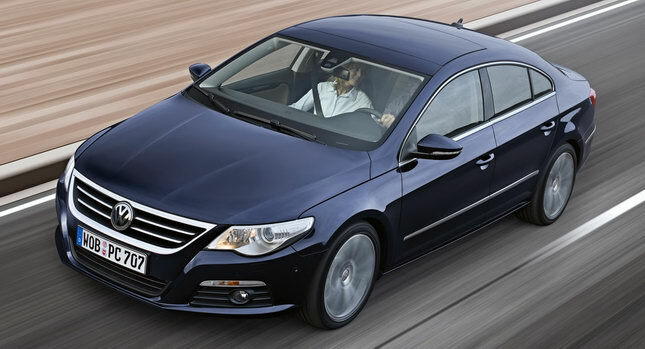 After all, the CC follows in the premium footsteps of the ill-fated Phaeton as Volkswagen’s most luxurious car. But there’s one crucial difference. While the Phaeton offered buyers little to lure them away from the more premium image of the Audi A8 upon which it was based, the Passat CC takes the well known Passat badge into a far more luxurious and upscale market. Essentially reversing the Phaeton formula, this exaltation of a standard model into the luxury market is a relatively new and interesting concept, and one that will remain unique to Volkswagen. Straddling the line between premium and economy markets, Volkswagen’s pairing of a completely new car with an existing nameplate helps ease the CC’s introduction through the Passat’s familiarity, but doesn’t sully the luxury product’s name with an unduly pedestrian badge. However, if this new marketing strategy has one drawback, it’s the degree of anonymity that it imbues upon the Passat CC, which brings me back to the previous point. As an automotive journalist, it’s not uncommon to be questioned about a new car from passerby who have seen it on TV or on the newsstand. Typically, questions pertain to speed, power, fuel economy and price, but in the Passat CC’s case, the most common question was “what is it.” And the answer usually came as a surprise. After all, with a sleek, coupe-like silhouette, it looks like nothing else in the VW line. Boasting a new and unique unibody, the longer, lower, wider stance of the Passat CC is already far removed from that of its namesake. Of course, it’s also improved with the judicious application of numerous small touches like frameless windows and a smaller, more flowing trunklid. In all but the basic Sport model, a panoramic sunroof provides ventilation from the driver’s side pillar to the passenger’s, and four different and unique styles of wheels provide model-specific identification. It’s worth noting that the top-spec V6 4MOTION Highline comes with a set of 18” wheels that may be the most attractive on the market today; channelling the turbine style made famous by Mercedes Benz’s SLR supercar. Opening the shapely door surprises even more than does the luxurious exterior treatment. Spurning many of the Volkswagen interior styling cues that populate the rest of the line, the CC’s interior is a welcome change. While the majority of VW products are endowed with somewhat monochromatic interiors, the CC’s contrasts colours, textures, and shapes beautifully to give the cabin an air of drama. First, there’s the simplistic (and admittedly familiar) dash pad that stretches uninterrupted from one side to another, directly above a long strip of bright brushed aluminum that incorporates a pair of slide-out storage bins.. Although conventionally laid out below, the controls are rendered in a new way, with switches and dials that appear to be an equal-parts collaboration between Audi and VW. Blessedly, the rubberized flat black finish that used to dominate VW controls is minimized, with the HVAC controls now being finished in silver and piano black. As a nice finishing touch, the automatic dual zone climayte control temperatures are now displayed around the switch in orange LED. The remainder of the HVAC controls are reworked substantially with a new layout that condenses the control panel and looks far, far more interesting without degrading their ease of use. Similarly, the steering wheel controls are quite a bit more high-tech looking, but still remain easy to manipulate. But best of all is the new navigation unit. Having long since been overdue for a revamping, my tester used a new touch-screen navigation system that is a massive improvement over the distinctly ‘90s looking VW-standard-issue indigo-illuminated entertainment systems of yore. With a glossy high resolution screen (think new, glossy laptop LCDs vs old, flat-finish laptop LCDs) and a slick black and red colour scheme, it’s thoroughly 21st century. Using a stocky block of plastic trimmed in aluminum as a key, the familiar VR6 powerplant fires up without any hesitation, but betrays its performance heritage with a slightly gruff sound while running through its cold start routine. Backed by the fantastic benchmark of a transmission that is VW’s DSG gearbox, moving away is a drama-free affair into which engine noise simply doesn’t intercede. With tons of soft-touch materials and undoubtedly a whackload of sound deadening, the Passat CC’s cabin is startlingly quiet while puttering about town, but the suspension gives away the car’s sporting demeanour. With a four link rear suspension and triangular wishbones suspended by MacPherson struts up front, the car rides with authority over undulations; transmitting the road surface into the driver’s derriere without overpowering it. Round a corner and the thick anti-roll bars put a stop to any perceptible body roll from unnerving any of the four occupants, while the low profile tires and 18” wheels provide nearly perfect levels of feedback. On dry and wet pavement the car handles exquisitely, and although its performance numbers may not back such a claim up, it feels every bit capable of challenging BMW’s indominatable 335xi sedan. With stupendous levels of grip, it’s holds its line through nearly every corner, with the powerful and linear V6 and lightening fast DSG gearbox working perfectly in concert to provide maximum thrust on every single corner exit. However, any buyers looking to traverse the snowy mountain ranges of Canada’s winter will need to invest in some winter tires, as the stock rubber is sadly inadequate when it comes to dealing with the white stuff. It’s not too often that a car surprises me. Having tested my fair share of automobiles, you come to expect certain qualities, both good and bad, to appear in any given manufacturer’s cars. After all, manufacturers put massive amounts of manpower into ensuring that each new model fits seamlessly into their existing product line; incorporating recognizable features and styling cues so as to not alienate their existing clientele, while adding just enough new stuff to attract new buyers that would otherwise never consider the brand. And although there may not be much to tie the Passat CC to the rest of the Volkswagen lineup, it would appear that they’ve hit the nail on the head. Because while the majority of the people who approached me about the car were unsure of its model designation, the fact is, most of those people were already driving Volkswagens. And be it due to the car’s slippery shape or upper-crust interior, the admiration those other Volkswagen owners felt for their favourite brand’s most luxurious offering was readily apparent. And thanks to Volkswagen’s marketing team, the Passat CC is a car that even the lowliest Volkswagen owner can readily aspire to own. With a starting MSRP of $33,075, it’s the V6 4Motion Highline that’s the real steal of the bunch with a fully loaded price of $49,100. Substantially less than you’d be paying for a similarly equipped 3-series Bimmer or C-class Mercedes, it’s stately and eye-catching looks and voluptuous interior offer fantastic value for your dollar. Easily the best Volkswagen I’ve ever driven, this is one car that I won’t soon forget.